The beauty industry is such a fickle creature, even more so the green beauty niche, where brands, bloggers, retailers come and go like waves. One of my OG brands from the start has been Kahina Giving Beauty, who manages to swim the uncertain waters of this industry with a quiet poise, releasing gorgeous products aligned in their attention to quality and craftsmanship. If you’re a sensitive-skinned reader who has e-mailed me over the years, I’ve most probably recommended a Kahina product or two (or the entire line) to you because of how gentle the products are. Even if you’re not sensitive-skinned, I probably suggested Kahina to you because their products are just plain wonderful. The Kahina Giving Beauty Oil Cleanser continues to uphold the brand’s well-deserved reputation. However, I would go a step further to say that it’s beyond wonderful (which it is), and high-quality (which it also is). Here’s the spoiler: Kahina Giving Beauty’s Oil Cleanser hits all the marks for what an oil cleanser should be, I don’t just consider it one of the best oil cleansers around but the best oil cleanser around (and I’ve tried my fair share). There really aren’t that many cleansing oils (green or not) that use this many plant-based oils. I had previously used the much-lauded One Love Organics Cleansing Oil, but truth be told, felt slightly underwhelmed at how there were only 3 plant oils in the formula. In this cleanser, we have Sunflower, Argan, Carrot Seed, Millet Seed, Rosemary, Calendula, Turmeric, Neroli, Geranium, Blue Tansy, Sandalwood – I think you’ll agree with me that the ingredients are so high quality that it’s basically a face oil grade oil cleanser. The unpronounceable ingredients in there are the emulsifiers, which means that this cleanser has the power of an oil to get rid of waterproof makeup (including eye product) and stubborn sunscreen but will emulsify or break down into a milky fluid when exposed to water. This benefit is a non-negotiable for me as I need the cleanser to rinse off my skin without leaving additional residue or even worse, oxidizing with the impurities left on my skin to create more trouble. That is the major issue that I have with pure-oil cleansers which do not rinse off well, sure you can use a cloth to wipe but that creates more friction/irritation, presents another thing you need to clean daily to prevent bacteria build-up, and is a very manual process so there is still no certainty that you’ve effectively removed everything. The texture of this oil is just right, not so thick that you’re not getting any traction with skin but not so thin that you’re just tugging and pulling at skin either. It has just the right amount of cushion and slip for a nice massage. The fragrance is similar to their Kahina Giving Beauty Essaouira Perfume Oil, very light, crisp and refreshing. The sensorial experience is definitely sophisticated and luxurious, and I delighted in using it every night. This really is a case where a smart, well-formulated product absolutely hits it out of the park. I don’t need to hype it any more than that. I think Kahina Giving Beauty really thought about what an oil cleanser should be and what people needed in terms of real-life performance that wasn’t being met. They created something that I think is flawlessly executed. This will be the go-to cleansing oil that will be in my routine from now on. There is no FOMO (fear of missing out), I’ve tried the rest, save your time and money, invest in this, your skin will love it, and you will thank me. Price: 100 ml for $59 (the bottle will last a long time – pictured is what I still have remaining after using about 2-3 pumps every night, 5 times a week since July save for a total of 3.5 weeks of travel from July to now). From now until November 4th, CREDO is having a 20% off Friends & Family sale (code: CLEAN20) while supplies last so be sure to take advantage and get this oil cleanser ordered quickly: Kahina Giving Beauty Cleansing Oil. 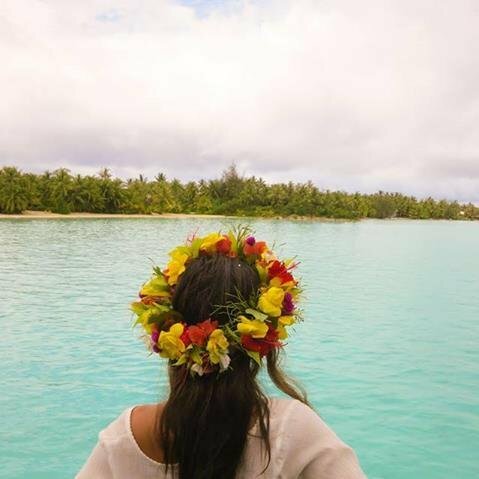 When I was a kid, the end of summer was the saddest time of the year for me as it meant going from carefree days filled with travel to going back to school. Now, as a grown-up, I relish in this time of year when I know the weather is going to hit that sweet spot between hot and cold, and New York feels “alive” again. This Labor Day weekend, I’m gleefully bringing the sweaters and coats out from storage while eyeing moisturizers that will soon come back into the rotation (hi, MV Organics Rose Moisturizer!). Tatcha Indigo Soothing Silk Hand Cream: a buttery lotion in a very durable tube that will travel well in your handbag. Somehow this tube holds so much cream that I’ve been using it for months without really making too much of a dent. It could also be that it’s so effective that you don’t need a huge glob. The indigo colored cream melts into hands, leaving a watery sheen that feels so soothing and hydrating. And I’ve said this before but I’ll say it again, this is one of the few hand creams out there that isn’t fragranced with synthetic perfume so the beautiful scent is enjoyable, not cloying. Josh Rosebrook Hydrating Accelerator: the spray on this is so fine, it feels like tickling your skin with a feather. Because of this, I often overspray my skin which isn’t bad because there are tons of wonderful organic ingredients. The scent is also really nice, I can’t really describe it other than it’s refreshing, clean, but delicious at the same time? Similar to the Tatcha hand cream, this is really light and durable, which means it is ALWAYS in my handbag. Beyond the convenience factor, this is important because it helps me increase my skin hydration since it’s easier for me to mist throughout the day no matter where I am. African Botanic’s Cloudburst Micro Emulsion: if you’re looking for a light moisturizer that won’t suffocate your skin but is packing plenty of active nutrients, look no further! What I love about this moisturizer is that it’s essentially a serum masquerading as a moisturizer. The ingredients are a who’s who list of anti-aging, hydration superstars, and as it’s African Botanics, you can trust that they did not leave out any of the good stuff, from hyaluronic acid, niacinamide, to peptides and algae and minerals. Part of the reason why the moisturizer is so powerful but light is due to what’s called a “water in oil” technology that helps the gel-like moisturizer to sink into the skin and then plump and hydrate. Lina Hanson Global Treasures: I love, love, love this balm. Have I tried Blue Cocoon? Yes. Have I tried In Fiore? Yes. But Global Treasures from the ingredients (coffee, matcha, gold leaf, pearl) to the presentation, to the silky melt-on-your skin texture, is just unrivaled to me. I love putting this on as an eye balm, it tightens, firms and nourishes so well. Have persistent dry spots? Press this balm in, it will disappear quickly leaving only a subtle glow behind. If you’re worried about balms being too heavy, I can say that this is probably the lightest that I have used, in fact, I use a separate balm for my lips because the active ingredients make this function more like a super nourishing serum. YÜLI Liquid Courage Antioxidant Serum: We can’t really have a discussion on glow-getters without talking about this gem. A good face oil can give skin that resplendent glow, but this one takes it to another level with brightening Vitamin C and Ferulic Acid (the combination is known to even undo pigmentation caused by sun damage), and a concentrated antioxidant cocktail that evens skin tone and instills radiance. The composition is really perfect where the oils soak right into the skin and wake up the complexion, due to actives like CoQ10 that really get to work on energizing skin. I like to put this on as an oil, antioxidant serum and primer before sunscreen and makeup because it’s so protective (boosts SPF) and functional, and in the night it’s a full-on anti-aging repair serum that leaves skin looking brighter, and more pristine the next day. Kjaer Weis Highlighter: If you want that goddess glow, Kjaer Weis’ Highlighter is a must-have. One swipe per cheek delivers that radiant sun-kissed touch. If you want that Bella Hadid contoured glow, just apply the cream highlighter with a brush onto the under-eyes (to immediately vanish any darkness and bags), down the nose (for sculpting), and a dash on the cupid’s bow. It’s so simple to look good with this highlighter because the formula is so universally flattering and blendable. Any notice will look like a pro, because of how versatile this product is. This is that single product that can produce the perfect filter in real life, you know the one that your favorite Instagram influencer has where the sunlight hits at just the right angle and intensity. Drop me a comment if you have questions about any of these products, or let me know what you’re using as we move from summer to fall! I remember my first foray into cleansing oils. I was a college student staying with a friend during the summer at her grad student co-op. TSA had lost my bag with all my skincare products so when night time came, my friend shared her products with me and I was immediately drawn to the chic bottle of Shu Uemura Cleansing Beauty Oil. “Wait, what is this? An oil… to cleanse your face?” I asked – keep in mind this was a time before people were putting face oils on their skin much less cleansing with them – “Yes, it’s an oil but trust me, it’s really good and cleans well just try it!” my friend reassured. To my surprise, the oil felt soothing and not greasy, cleansing and not messy. I became a convert and upon returning to work at Neiman Marcus, I immediately got a bottle for myself. I imagine this is an experience that many who have discovered cleansing oils may share. 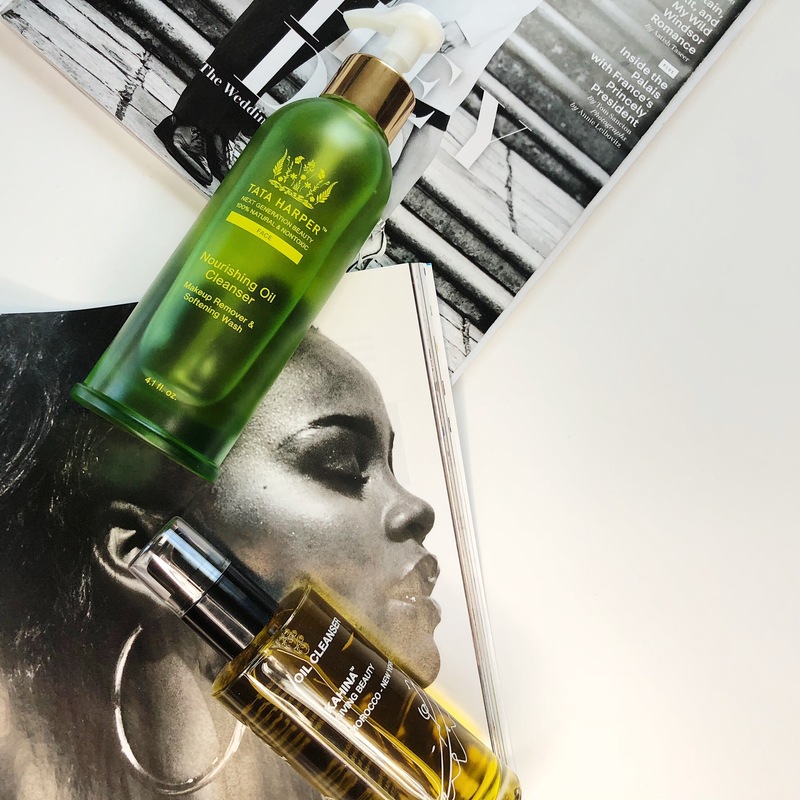 Now, it seems that every brand has a cleansing oil and for those of you not acquainted with cleansing oils, I put together this little guide to help. Cleansing Oils: What are they? Let’s start at the beginning. Cleansing oils are not new, they’ve been around. In Fiore (who has their own LUSTRA Cleansing Essence) purports that oil cleansing is steeped in practices traced to antiquity, as chronicled in beauty rituals in ancient East Asian, Egyptian, and Greek civilizations. In modern times, it was first prominently used as a dutiful makeup remover by makeup artists on fashion shoots and for performances. The oils are able to dislodge water-proof makeup including mascara and stains that water-based cleansers have a hard time removing and where strong soap-based cleansers may agitate skin. The oil’s powerful performance in removing makeup yet gentle nature (as only mild gliding on the skin is necessary), resulted in them becoming the go-to medium for makeup removal. However, in the 90’s and early 00’s, the skincare game was dominated by “oil-free” products and any oil based product brought to mind a product that would be heavy, greasy, and skin-clogging, so cleansing oils remained an industry secret. Micellar Water, a suspension of oils in water was introduced as it was thought to be more easily accepted by the mainstream oil-phobic shopper, despite their performance being a literal watered down version of pure cleansing oils. Although we now place them in their own category of cleansers, functionally it’s more accurate to class cleansing oils as makeup removers. Cleansing oils dislodge surface level impurities and are great for removing makeup and sunscreen. The oils can also be massaged around bare skin to help dislodge trapped and oxidized sebum on the skin surface, including pore-clogging blackheads. Can any skin type using cleansing oils? Yes, with caveats. As I stated before, cleansing oils should be thought of as make-up removers or what some people like to call the “first step cleanser”. It’s not a product that I recommend using as the sole cleansing step because it works on a surface level so you aren’t giving your skin that deeper level of daily cleansing maintenance. As a first step cleanser/makeup remover, even those with acne prone skin and sensitive skin will benefit because cleansing oils work very gently, are good at removing surface level impurities that can contribute to irritating skin, and the oils do not strip skin which is really ideal for the skin barrier. Bonus: if the oils come from good plant oils, skin receives a wonderful addition of antioxidants and vitamins. Do follow through with an actual cleanser, which can be a cream or gel, that cleans deeper and you’ve got a great system in place. What types of cleansing oils are there? I categorize cleansing oils as those that emulsify with water and those that do not. There is no clear-cut winner because there is a trade-off: purists may prefer straight oil blends that are filled only with the good stuff (see May Lindstrom Pendulum Potion) even if they’re harder to wash off, while the performance-minded may prefer cleansing oils (like One Love Organics Vitamin B Enzyme Cleansing Oil) that have emulsifiers that rinse cleanly. I prefer cleansing oils that emulsify with water for an easy rinse to make sure no residue is left on my skin. I do not want there to be an excess layer of oils that can block the penetration of essences and serums that follow cleansing. Pure oil blends also require muslin cloth, steaming and/or hot water to wash off, a process that I believe to be too abrasive for daily cleansing that it could actually sensitize skin. With that said, if you have a great 2nd cleanser (I swear by YÜLI Halcyon Cleanser), you can do a casual rinse and follow with your second cleanser to get everything off. How do you determine if a cleansing oil is good or not? Always read the ingredients list. I like my cleansing oils to be made from high-quality plant oils, so if I see a cleansing oil made from mineral oil or plant oils that are not organic, it’s a no go. You might as well buy a bottle of organic Sweet Almond Oil or Olive Oil instead. Also, if you have a preference between emulsifying cleansing oils versus pure cleansing oils, check the ingredients to make sure the product is the type you like by looking for emulsifiers which typically have a non-botanical name. It also helps to read the “how to” to see if things like muslin clothes are required to get an idea of how easy the oil is to rinse. 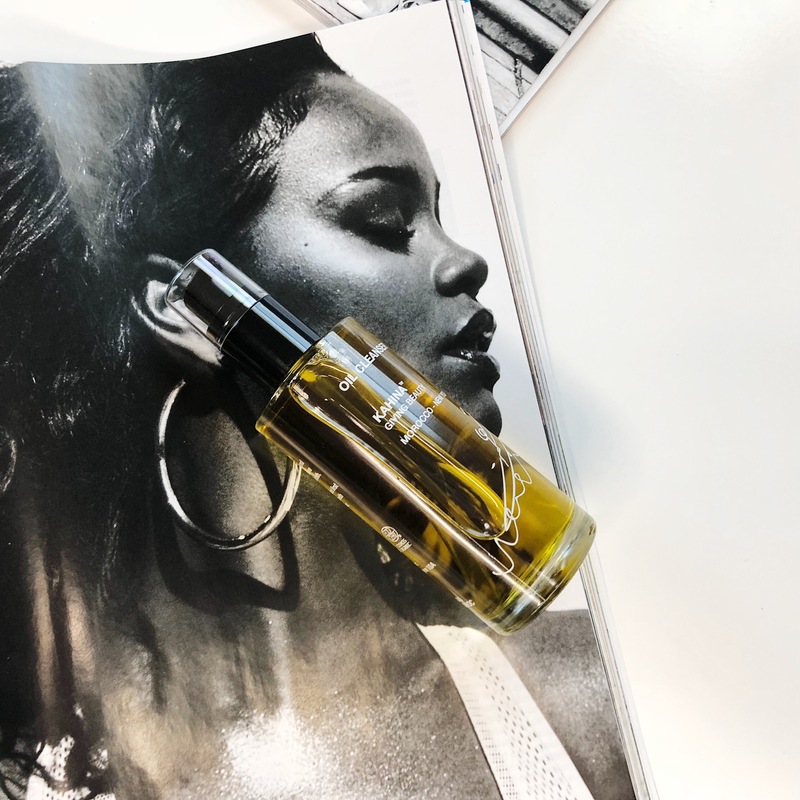 If you are able to sample the cleansing oil, find an oil that has a nice “bouncy” texture where you can glide it around your skin without it pulling or tugging. That weighty texture also helps nourish skin and is a good indicator that the oils have a larger molecular size so they stay on the skin surface which is good in an oil cleanser as you do not want the oils to sink into your skin. Similar to face oils and juicing, for cleansing oils, I will only buy clean formulas made from organic plant oils. Jose Rosebrook, May Lindstrom, In Fiore oils are where I’d steer you toward if you want a pure oil that does not emulsify. You can’t go wrong with any of their formulas which use high-quality organic plant oils, just play around and see which texture or scent suits you. 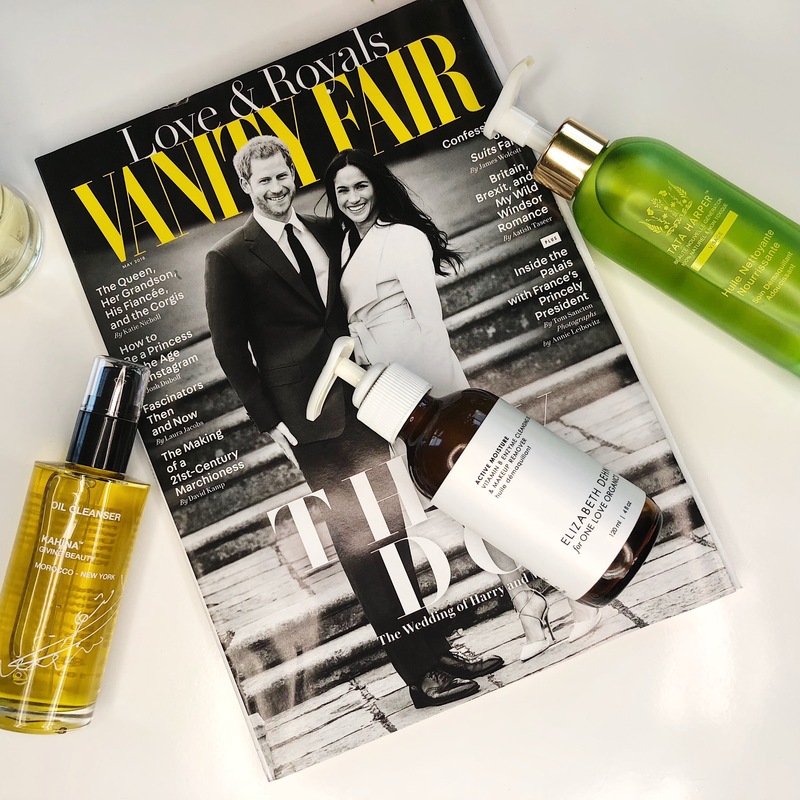 Now, onto the emulsifying oils that I prefer to use: the green community long-standing favorite, One Love Organic’s Vitamin B Enzyme Cleansing Oil is one that I’ve tried, loved and repurchased. It’s a nice hefty weight, made from sunflower and papaya seed oil, smells like pina colada, and emulsifies for easy and fuss-free removal. 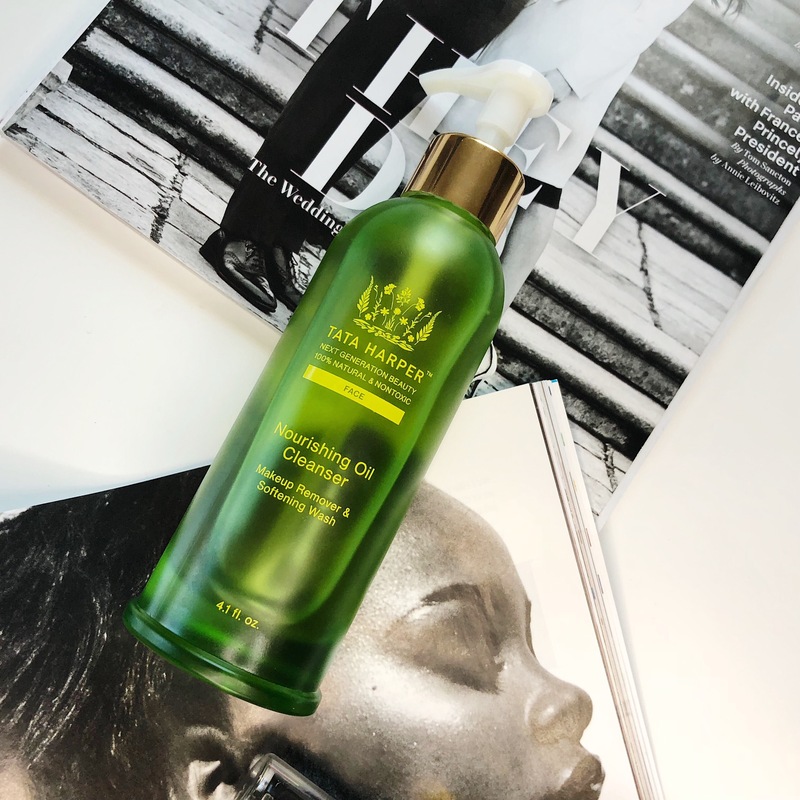 I’ve purchased Tata Harper’s Nourishing Oil Cleanser which I honestly thought was going to blow all other oil cleansers out of the water but it left me surprisingly disappointed. The oil is great, it smells wonderful, feels fabulous, and even has this ability to soften skin. Where it falls short is how it emulsifies, upon contact with water, the cleanser congeals with the surface impurities (sunscreen and makeup) into a sticky almost rubbery white film on the skin surface that is nearly impossible to rinse off without the help of a cloth and second cleanser that foams. I don’t think this is a case of a product not working with my skin or individual preference, the formula falls short in delivering the cleansing experience because I can’t imagine anyone would find the stubborn rubbery film desirable. A new release from Kahina Giving Beauty, the Oil Cleanser, is one I’ve been testing for the last two weeks and it’s been an absolutely flawless experience. The oil’s subtle fragrance reminds me of the Kahina Giving Beauty Essaouira Perfume Oil which is one of my favorite oil perfumes (bright, fresh and crisp). I used 3 pumps and it cushioned my skin with soothing sunflower, argan, carrot seed and calendula oils. Although I was done, I kept massaging the oil on my skin as it just felt so good. Upon rinsing off, the entire formula just melted off with water. The packaging is also gorgeous as you get to see the beautiful oils. I’m not going to beat around the bush here, Kahina Giving Beauty’s Oil Cleanser is hands down, my favorite cleansing oil. If I left anything out or if you have a question about cleansing oils/any of the products I mentioned, please leave a comment!